When a hypocritical self righteous pastor tries to run a visiting Freak show and Circus out of his sleepy little town of Ashbrooke, things get out of control and all hell breaks loose. The Ringmaster refuses to leave, so the pastor calls for his parishioners to trample the circus to the ground, but things go horribly wrong and it gets burned to the ground instead and all the circus folk with the exception of the Circus fortune teller Madame Zadora, perish in the flames. The pastor and his faithful henchmen hide the crime and bury the victims in a mass grave that they cover with the only standing remnant of the burned circus, the Ringmaster's wagon. Unbeknownst to anyone except the Ringmaster and Madame Zadora, earlier she had procured a secret elixir for the snake oil selling Ringmaster. It had come all the way from her Romanian homeland, and it was supposed to have the power of longevity if used correctly. However the legend spoke of horrible curse that would befall any who use it incorrectly. Sixty years later, after the little towns horrible secret has been long forgotten, another little circus rolls into the sleepy little town. While setting up for the next days performance, the circus boss Carson Bailey, who was an ex con that suffered stroke and was paralyzed on one side, stumbles across the only surviving remnant of the forgotten circus of the past. The Ringmaster's overgrown wagon that had been left to rot. He sneaks into the wagon and finds the elixir and while smelling the glowing blue liquid, inadvertently gets some on his fingers and in his mouth while popping the cork on the small bottle. Disgusted at first by the putrid taste of the elixir, he soon realists the miracle potion has cured his paralysis. Soon after finding the miracle tonic, he drags his Chinese acrobat girlfriend, Pei Chee into the wagon to show her his new discovery. He gets all excited that he is going to sell it for millions and run away from the circus, but she does not want to join him and they get into a huge argument. During the argument, Carson hits Pei Chee with his newly re-energized hand and unintentionally kills her. Being an ex-con and knowing the trouble he will be in if the authorities find out, he decides to try the miracle elixir on the dead girl to heal her, but instead it brings her back to life as a living dead zombie. 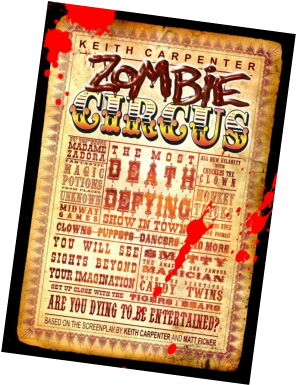 She attacks Carson, killing him but while doing so, the hundreds of bottles of the elixir get broken and the mystical liquid seeps through the floor boards of the old rotting wagon, onto the mass grave of the dead circus performers of the past. Soon after the zombification of Pei Chee, her newly killed victim Carson and the charred decayed corpses of the reanimated circus of the past, rampage through the circus grounds leaving living dead victims behind their wake until it becomes a full blown circus of the living dead. Now to make things ever worse, our young machanic hero of the story Brian Keeping and his two friends, go out to the newly set up circus to make a delivery and maybe catch a bit of the dress rehearsal. But needless to say they find much more than that when they get out to the circus grounds of the living dead.